The Faerie Review: What's Up in the Attic? Title: What's Up in the Attic? 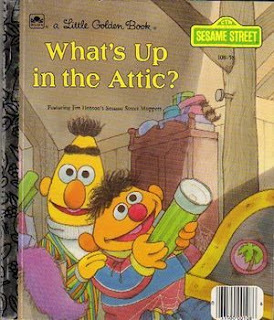 Synopsis: Ernie and Bert, stuck inside on a rainy day, go up to the attic, searching for the board game Duckie Land. Instead, they find a trove of family mementos, including Great-Aunt Ernestine's trunk, Uncle Bart's paperclip collection, Ernie's old tricycle, Bernice's baby pictures, and Mountain Mike's coonskin cap. Review: A fun read for kids, and one I loved as a kid. A fun classic of what treasures you can find hiding in storage.